The times they are a changing, and seems like it get’s harder and harder to keep up every day. Benjamin learning to cook in the kitchen on his own, Sparky (our 14 year old mixed breed dog) escaping from the deck gate yesterday and today, and three kittens under foot, we have our hands full now. Not to mention what is happening in the outside world, what with the current egg recall, due to having “the potential to be contaminated with salmonella,” and deli meat recall with Listeria monocytogenes, all is spinning faster and faster these days! Yes, I said, kittens are underfoot! Three tuxedo kittens, named Ryana, Missy Bella, and Delilah! Backing up a little, it was just a year ago that our then fourteen year old cat “Kitty” had passed away, and about a month or so ago Monique and I started thinking of getting another cat. Well…three weeks ago we did just that, but times three! 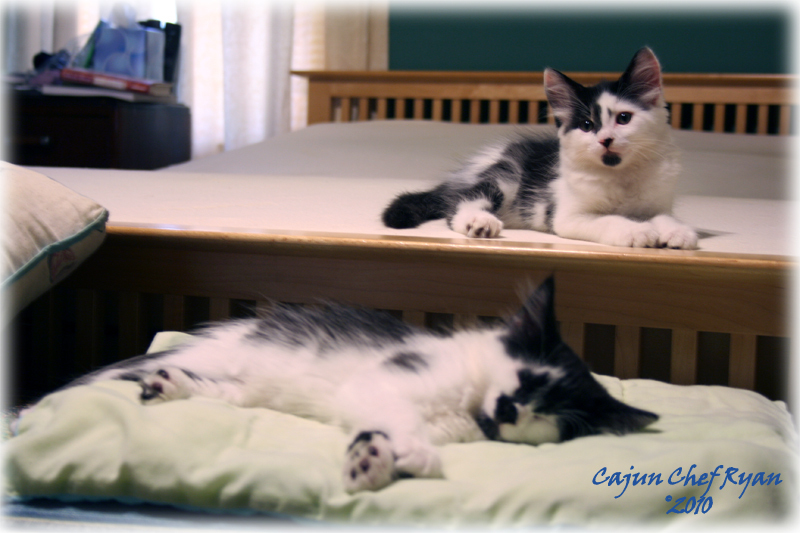 Yes, we have three kittens, they are ten weeks old now, but when we got them they were only seven weeks old. We were at Pet Smart getting some treats for Paco (our tea cup Chihuahua) and started looking at the cat adoption section, and Monique started the process and paperwork for an adoption. Then we drove to the grocery to pick up a few things, and in the parking lot Monique thought we should check out Pet Mania, to see if they had any kittens. No kittens, but they did have a flyer posted on the bulletin board for FREE LOWE’S KITTENS! 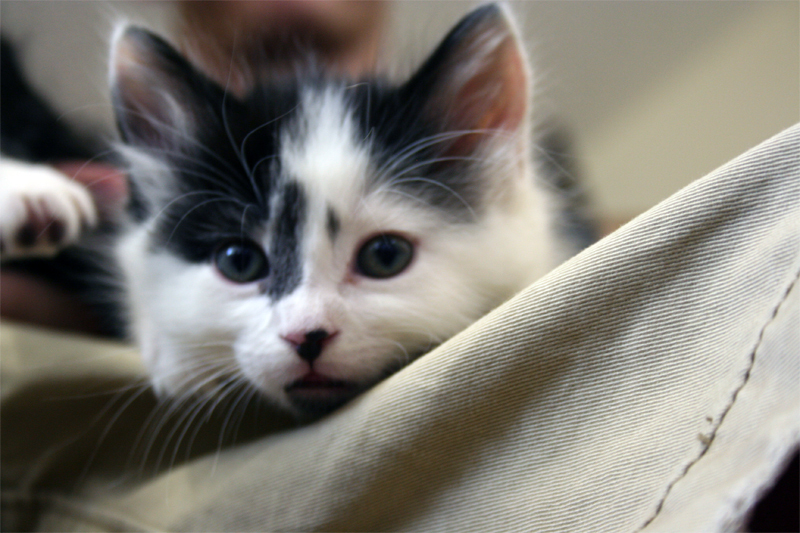 Yes, the Lowe’s cat, as it is named, because it lived in the Lowe’s grocery store parking lot for several months, was finally taken in by a kind family, but three days later they found out that it that it had six kittens. 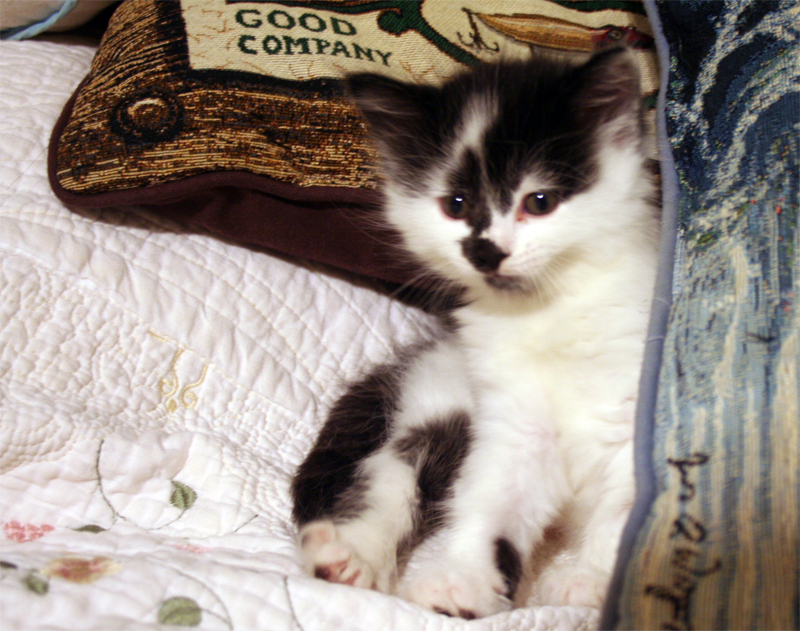 The kittens were in a box behind the grocery store, and were rescued by the same family. Monique called the family and spoke with the ten year old granddaughter, who turns out had taken on the project of taking care of the cats, and she named all of them. Monique took down their address and made arrangements for us to meet with the family around eight o’clock that night. We hurried through the store and got to the “kitties” house shortly after eight thirty. Once in the sectioned off kitchen area of the house we finally got to meet the five kittens that were remaining, all girls, the lone boy was given away earlier. After introductions and several minutes of watching the kittens and mother playing I took a seat on the floor and started playing with the kittens. 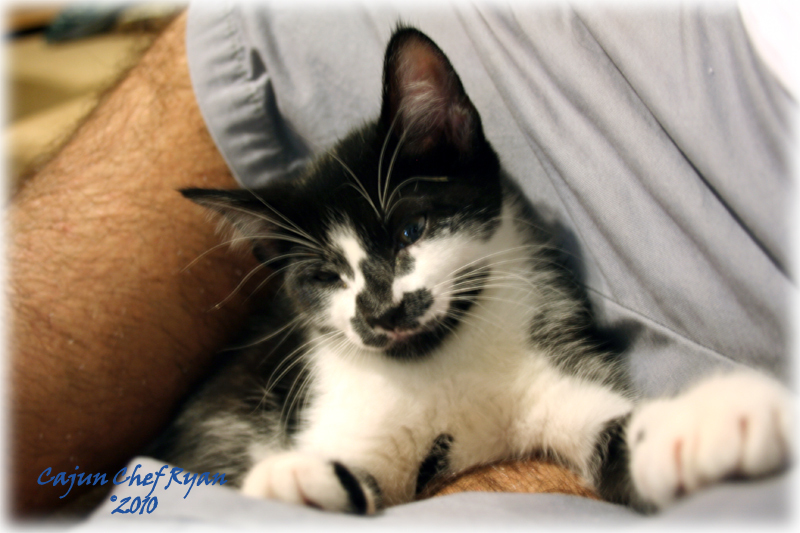 With my legs crossed, one of the kittens named Riana climbed between them and curled up and went to sleep. The family said that she has never gone to anyone before, and I was the first one it has ever approached. The story about Riana is that at first they thought she was a boy, and originally named her Ryan. Well, after that story how could I not keep her, I have renamed here Ryana. Missy Bella took to Bryan really well, in fact when we debated about which cats to take, every time we reconsidered Missy Bella she would look up at Bryan with those cute eyes full of love, we could not let her go. 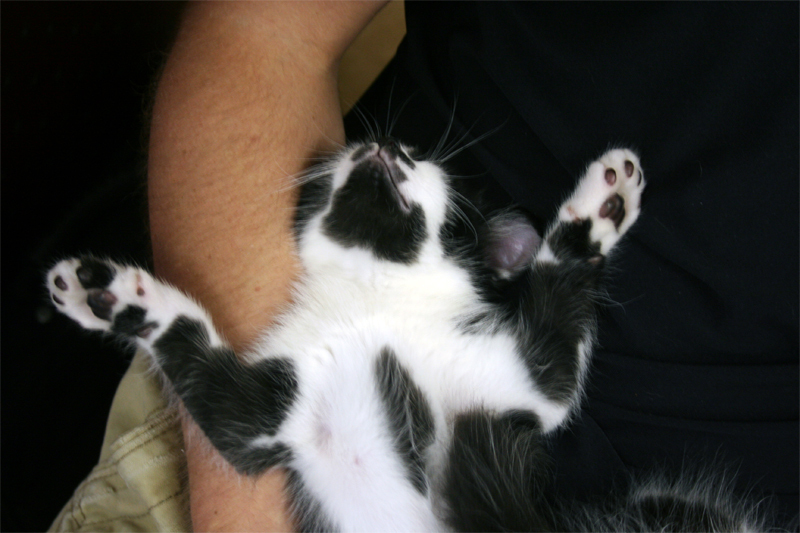 And the same with Delilah, she took to Ben really well, in fact, they both fell asleep in their laps and arms. It was so hard to say no to all three kittens. 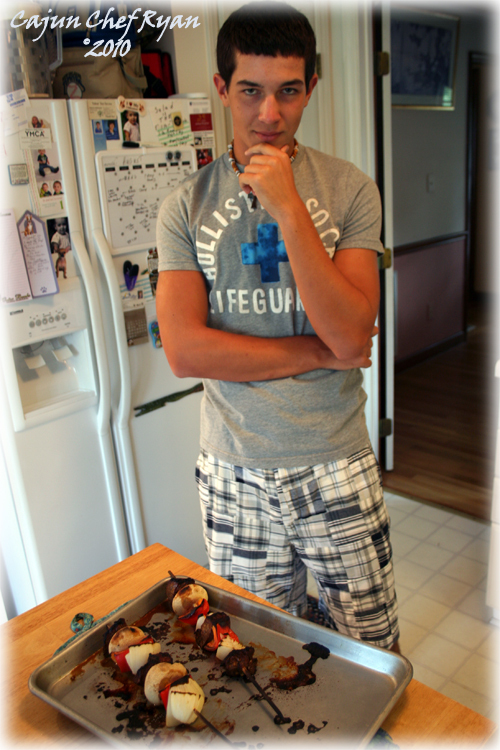 This summer was the first that Ben would be home alone most of the time following the traditional school schedule, the past three years he was on the year-round with 9-weeks of school followed by 3-weeks off. Now, with three contiguous months of time off he would be fending for himself with lunches. Until a few weeks ago, Ben was heating up frozen dinners, leftovers, or making the odd sandwich. All this changed several weeks ago when Monique and I decided to approach Ben with the idea that he starts learning how to cook on his own two feet. Our two-pronged approach to saving money, and teaching Ben lessons on being self sufficient were enough to get his attention. 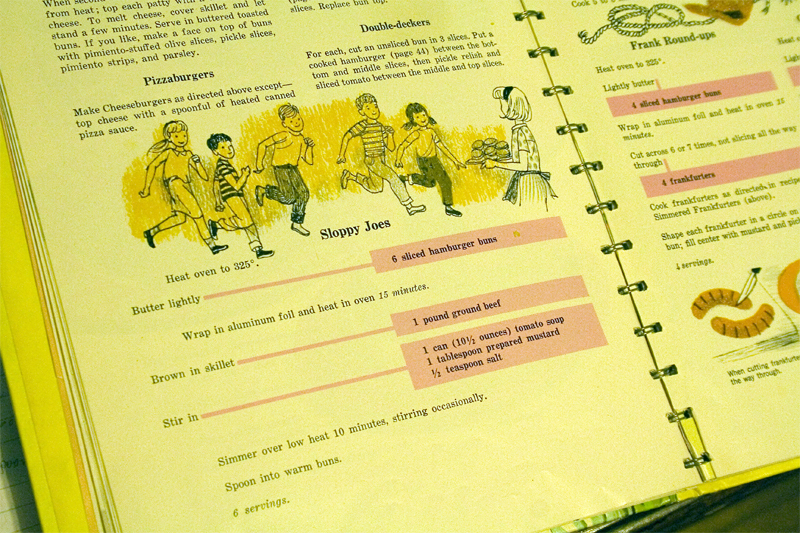 So with some quick brainstorming and ideas of grilled cheese sandwiches, hot dogs, salads, burgers, and such, Monique got Ben searching in several cook books with a bent on helping children prepare their own meals. 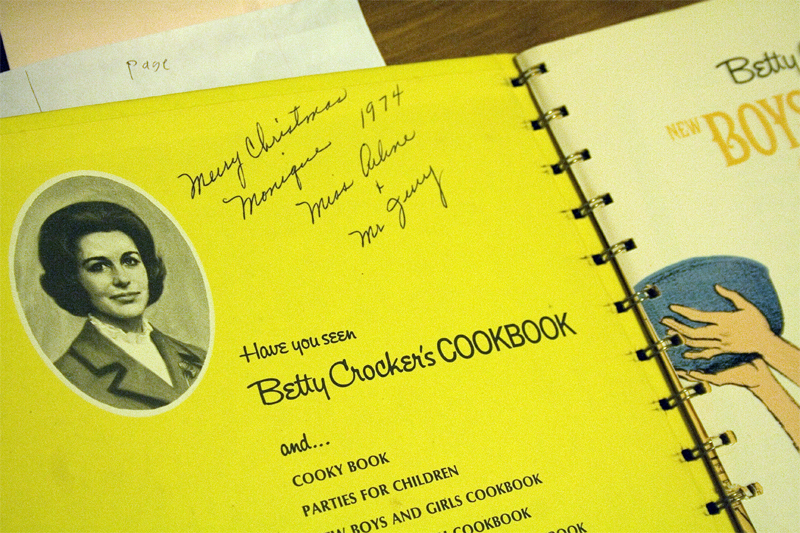 Inspiration came from the old “Betty Crocker’s New Boys and Girls” cookbook from 1973 that was given to Monique when she was nine years old, and the other cookbook is Emeril’s “There is a Chef in my Soup”, from 2002, and Ben picked out three recipes, Beef Kabobs, Hamburgers, and Sloppy Joe’s, all beef related meals. With Monique and I starting up a twelve week regimen of the ETL diet we would not have much meat in the house, so Ben wanted to make up for that fact. 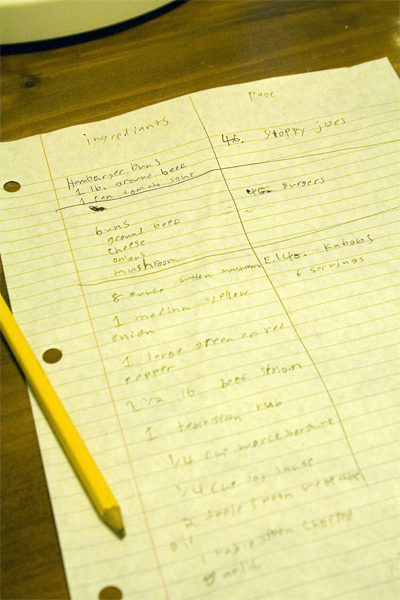 With instructions to write down the reference pages for the recipes in the cookbooks and a separate list for the ingredients, Ben had completed his first task of meal and menu planning. With our shopping lists in hand we all took a trip to BJ’s and Lowe’s grocery to procure the ingredients. 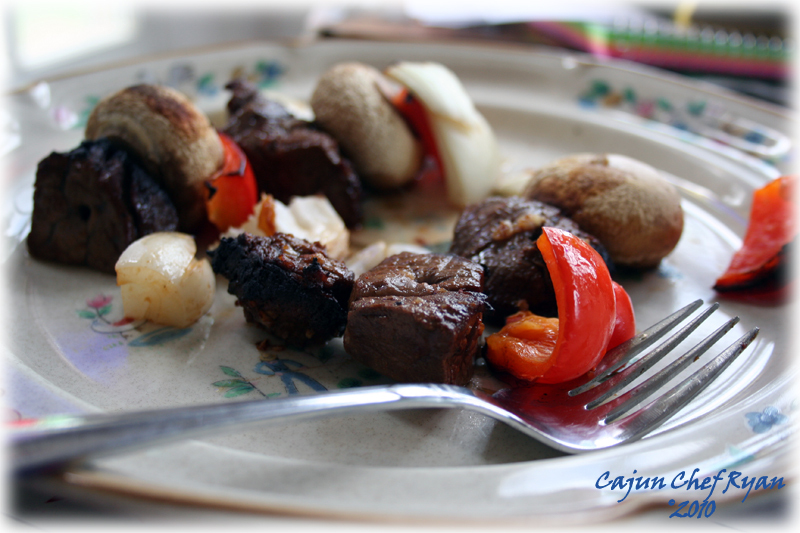 Once home and all the spoils put in their proper places, I assisted Ben with prepping his first meal, the Beef Kabobs. First, we got twelve bamboo skewers out and into a large flat container, and then covered them with cool tap water. Soaking the skewers for several hours or days in the water prevents them from burning while cooking under the broiler or on top of the grill. The original recipe called for sirloin steak, we found some tenderloin filets that were only a few dollars more, so they were snagged up instead. Demonstrating the technique for cutting the silver skin and fat from the tenderloin filets, I always make a point of the fact that you always make cuts away from yourself, thus preventing any possibility of cutting your own skin. Once the filets were trimmed I showed Ben how to cut them into 1-inch chunks, then he finished the last of them. Ben put together the marinade which consists of soy sauce, Worcestershire sauce, garlic, salt and pepper, steak sauce, and a little olive oil. Once mixed well the beef tenderloin chunks are well coated and allowed to marry for several hours. Onions, mushrooms, and sweet red peppers are then prepped and cut into large 1-inch chunks, these are all tossed together into a large bowl and covered until ready too make and cook the kabobs. When it is time to eat, preheat the broiler to the highest setting, or if grilling, get your coals hot and ready. Get the marinated beef chunks and prepped vegetables to the preparation table. With the soaked bamboo skewers start with a mushroom, then an onion, and then a sweet pepper, then a chunk of beef, repeat until you have two beef chunks and end with another mushroom. 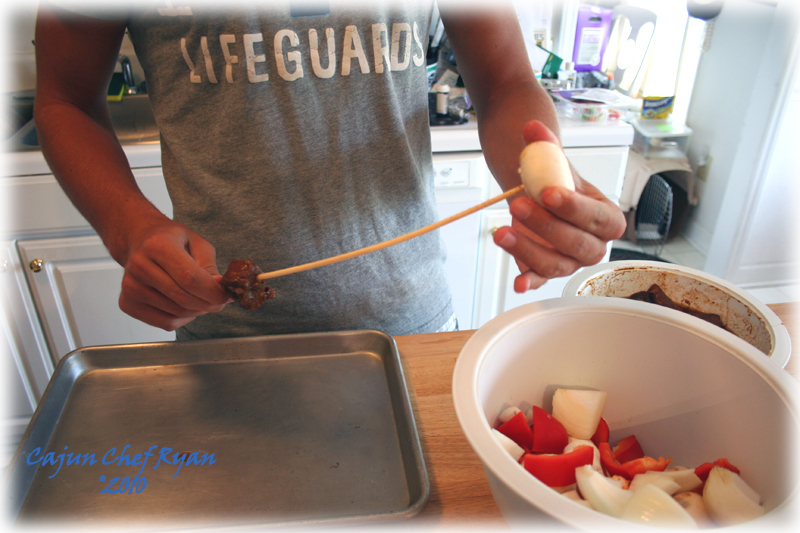 Set up two skewers per person, and then return the remaining ingredients to the fridge. If broiling the kabobs, just place them on a lightly coated sheet pan and broil about 6-inches from the heat, turn after six minutes, then continue for six more minutes for medium, less time for medium rare beef, or more for well done beef. On the grill, place them over the hot coals, and turn after six minutes, follow the same time remaining as for broiling, depending on the doneness that you proffer. When the kabobs are done, use a fork to gently release the ingredients from the skewer and slide them onto your serving platter or individual plates. We used one and a half pound of tenderloin made six meals for Ben, or about twelve total kabobs. 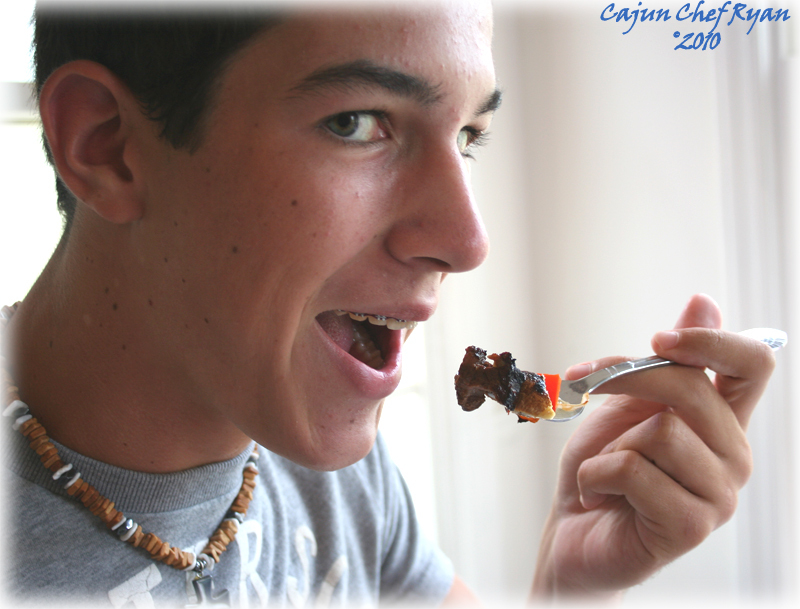 Of course, I would image that lamb chunks from the leg meat would be just as good in this recipe also. 1. If using bamboo wooden skewers you will want to cover them with cool tap water and soak for at least several hours before using them on the grill. 2. Place the cubed beef in a medium bowl then coat well with the Finger Lickin’ Rub. Add the soy sauce, Worcestershire sauce, balsamic vinegar, olive oil and garlic. Stir well to combine, then cover and marinate chilled for at least 2 hours. Can be left to marinate for several days under refrigeration. 3. Have mushrooms, sweet red pepper, and onions prepped and ready in another bowl. 4. When ready to cook, pre-heat the broiler to the highest setting. Thread a chunk of beef, then an onion, then a pepper, then a mushroom, and repeat this process until you have two or three of each on the skewer. 5. Place the skewers on a baking sheet pan and then broil 6-inches from the flame for six minutes, then turn and broil until your desired doneness, continue for six more minutes for medium, less time for medium rare beef, or more for well done beef. 6. 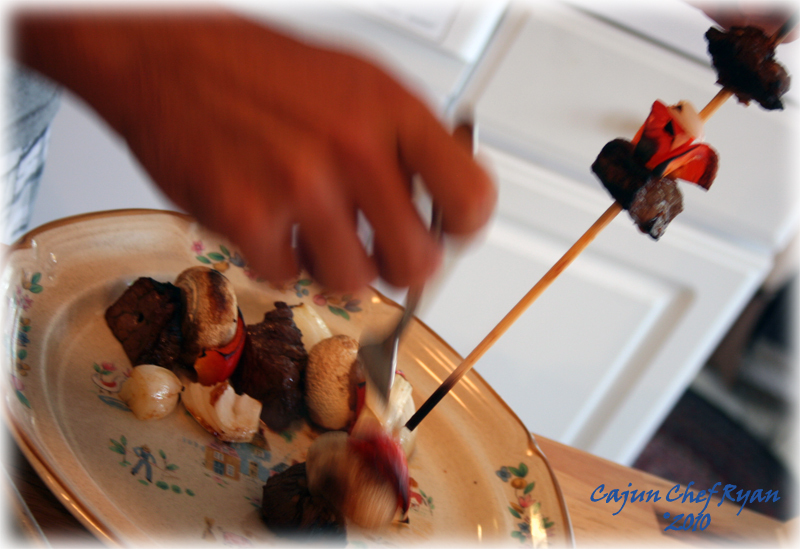 Using a fork, push the cooked ingredients from the skewer and onto a plate. Serve immediately. Aww Chef the kitties are so cute and Ben is lucky to have a great chef to teach him. Good luck with the diet and your new family additions! You’re such a good person for taking all three sibling kitties together!! I know they are in a great home with great food! 🙂 Your kids did an awesome job with the beef kabobs, they look delish! Ryan, what a great post. 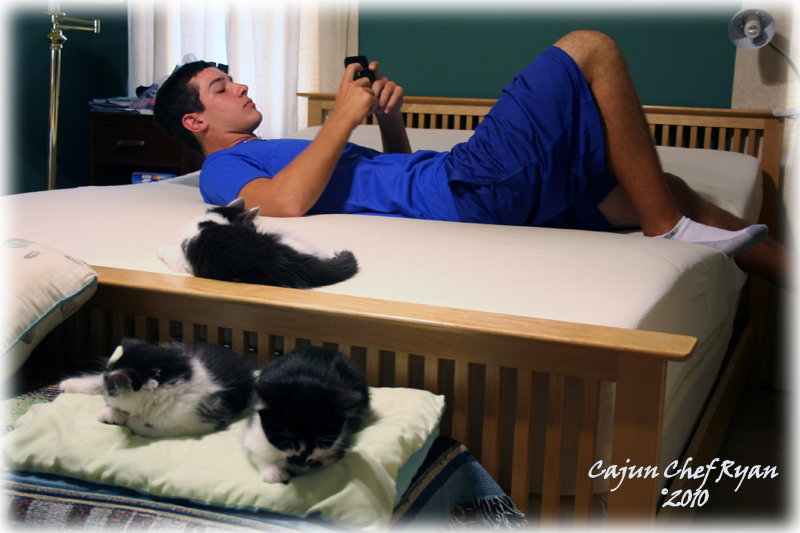 The kittens are so adorable and it looks like they are going to be attached to Ryan! The plate of food looks awesome! 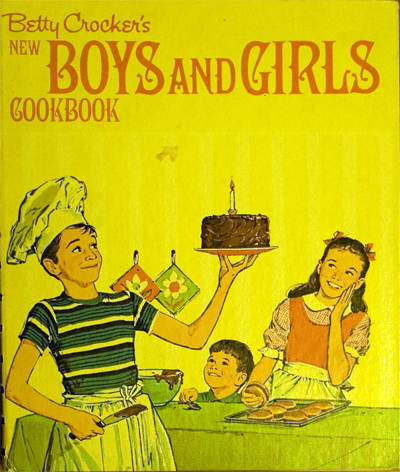 That’s so cool that Ben is learning to cook. I wish my parents had taught me. 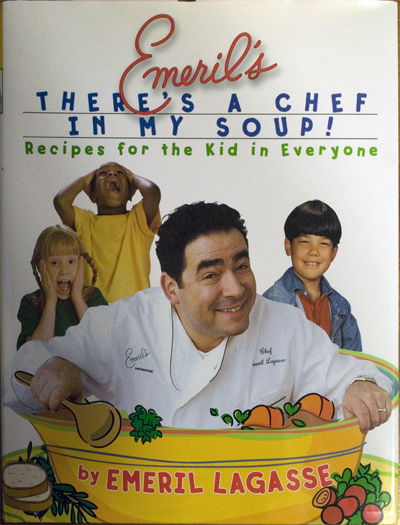 Luckily, I had a college roomate who knew her way around the kitchen and was happy to take me under her wing. What sweet little kittens! They look very happy in their new home. I love the story of Ryana. 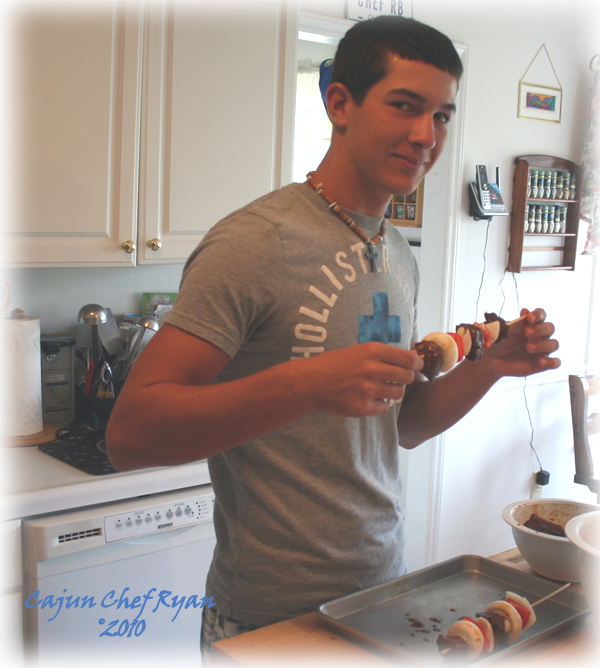 Ben did a great job with the beef kabobs–they look awesome! Those kittens look adorable like oreo cookie cute! Huge cat lovers here~ love love love them triplets! Ben’s lucky to learn from a pro. Lots of cooks leave the silver skin on meat and end up with a disappointing meal. I’m so thrilled that Ben’s learning from you. While in high school, my mom wanted me to stand by her in the kitchen while she made fantastic Armenian food but I was a dork and refused. I regret that now. I’m jealous of your three kittens. I’d love that many, but hubby disagrees so we just have one. Awesome job with the kebabs, Ben! Such adorable kitties! Your kebabs look great, Ben! Did you know that women love men who can cook? It’s a great skill to develop. Adorable kittens! We have an 17-year-old tuxedo cat. The younger they start, the better ! Fantastic. Love it. Lucky you!!!! I don’t blame ya for getting all three; they’re look like lovable bundles! And kudos to Ben on his cooking!